Blimey, supergroup Tired Pony is the music equivalent of a comic book superhero team up. You’ve got Gary Lightbody (he of Snow Patrol), Peter Buck (he of R.E.M. 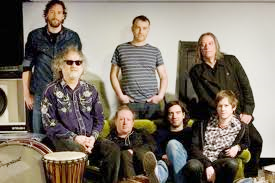 ), Scott McCaughey (he also of R.E.M. ), Richard Colburn (he of Belle and Sebastian), Iain Archer (he that is a mega-successful songwriter) Jacknife Lee (he that has produced numerously well-received albums of the last decade) and Troy Stewart (whoever he is), all brought together in the love of creating good music. Even with the American talent involved, Tired Pony seems a British-led act that is very much inspired by country music and Americana in general. It’s our interpretation of the sounds and feelings of a culture that we grew up tapping into, but is shaped by the isolation of existing in a tiny, rainy island in north Europe. Because of that, it sounds special. With such a top-tier music ensemble that all have other ongoing active commitments, coordinating the logistics of making a music video must be too complicated. Therefore, this is the best that can be done.